Oarfish are a rarely seen family of fish comprised of four species, the most famous being the Regalecus glesne, or king of herrings, the longest bony fish in the world. Though human contact is rare, oarfish are thought to be abundant as they are found in both temperate and tropical waters around the world. They rarely come up to the surface, the major reason behind the few sightings, as they prefer depths of 600 to even 3,000 feet deep. The origin of the name “oarfish” is unknown, but there’s little doubt it was named in reference to its elongated body and oar-like pelvic fins. Its dorsal fin is bright red, and runs across the entire length of the back beginning above its relatively small eyes. The term “ribbonfish” has become a popular nickname, given the brightness and fluidity of its fins and its body shape. The challenge of finding an oarfish, its large size, and better technology has made oarfish fishing an ever-growing pastime. The bigger species are considered a game fish, though its flesh is not considered that great for eating and is therefore left alone by commercial fishing industries. Oarfish may refer to any of the four subspecies, but it is usually used to describe the king of herrings, or giant oarfish. Despite its name, it is not a herring of any kind, but was so named after being spotted near shoals of herrings. They are scaleless, silver in color, with a long red dorsal fed that crests at the top of the head, resembling a kind of mane. A drawing of an Oarfish that washed ashore on a Bermuda beach in 1860. 16-feet in length, those who discovered it labeled it as a sea serpent. 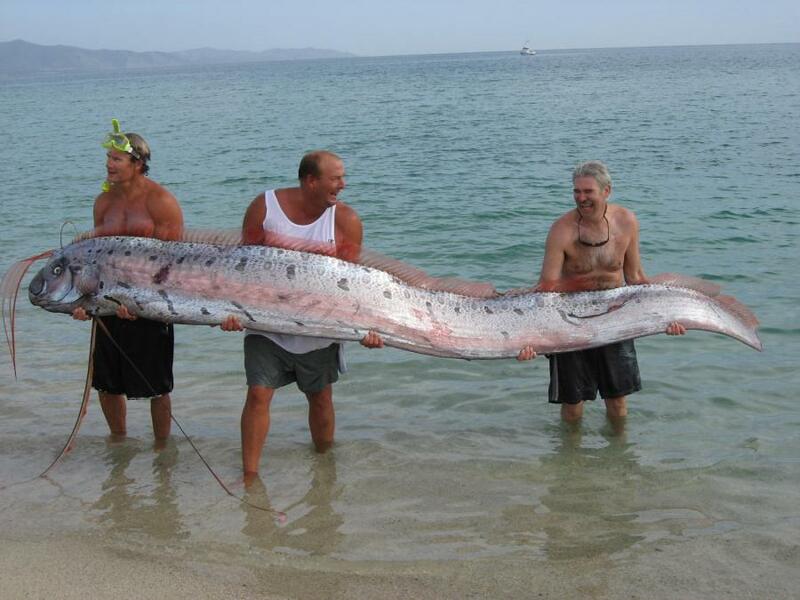 The defining feature of the giant oarfish is its length. The largest oarfish ever reported measured a monstrous length of 56 feet (17 meters), though on average, giant oarfish grow to be 20-30 feet in length. The king of herrings serves as one of the main source for sea serpent tales made popular in the ocean exploring/whaling days of the 1800’s. When a 16-foot long oarfish washed onto a beach in Bermuda in 1860, it was labeled a sea serpent, and widely accepted as such. The legend of its size spread across the world, with many speculating that bigger – and as a result, more dangerous – sea serpents existed in the ocean, waiting to attack unwary ships. Check out the video below of the first live giant oarfish caught on tape and see for yourself how it could be described as a sea serpent. Despite its link to being dangerous sea serpents, there are no reports of any violent behavior from oarfish towards humans. They are a solitary creature that rarely ever comes to the surface, only doing so if on the verge of death. There are few underwater sightings, but in rare footage, giant oarfish show a propensity to swim in a vertical position, using its dorsal fins for movement while keeping its body very still. It is speculated that this is a feeding position, with prey primarily being zooplankton, shrimp, and other crustaceans, small fish, and squid. Below is a video of an oarfish suspended underwater in the vertical position. Oarfish are pretty well solitary right from birth. Once eggs are laid, they float near the surface, incorporated into the zooplankton, growing no bigger than a quarter of an inch across. Giant oarfish have been known to spawn off the coast of Mexico between the months of July and December, but no one knows of their migration pattern or even how far the travel between spawning. Because adult oarfish are not historically known to reach the surface very often, some cultures view a sighting as an omen. In Japan, it is an old myth that when “ryugu no tsukai” come to shore (also known as slender oarfish, or “Messenger from the Sea God's Palace”), an earthquake is soon on its way. Most scientists agree that this is nothing more than an Old Wive’s tale, but do admit that given their closeness to fault line while swimming the ocean depths, it is possible, though highly unlikely, they can sense quakes given their proximity. So the real question is, can you actually go out and fish for these sea serpents? Unfortuantely for the adventurous angler, it isn't feasible. A giant oarfish's range is vast, and their preference for deeper water makes targeting them nearly impossible. However, many commercial industries have caught oarfish by in their nets, but it is generally accidental as oarfish are known to have rather undesirable flesh. In terms of rod-and-reel accidental catches, there is one famous example that occurred back in 2003. Val Fletcher, a 40-year old female angler from England, managed to make the one of the most unique fishing catches in history while fishing for mackerel from shore. After a 40-minute fight against what she originally thought to be a giant sea bass, an 11-foot oarfish crested the water. Talk about a trophy fish! Fletcher's catch is, however, not likely to be replicated all too often. As mentioned above, sightings near the surface typically translate to an oarfish nearing death, meaning these sea serpents are not a viable target for some deep sea fishing.